I hope I'm still welcome at the Today's Flowers meme, considering I haven't participated for so long *hanging head in shame*. These beautiful flowers adorn the Kalanchoe, which my lawyer-boss in Ohio bought me for Secretary's Day one year. I especially love this gift, because it blooms and brings beauty to my home when nothing else is blooming. We put the Kalanchoe on a desk by the window, and, apparently, it likes it there, because it has really grown and its stems reach to the window to enjoy the sunshine. It has produced more flowers than ever this year too. Lovely flowers. The deep pink is stunning. I really like the colour of these blossoms! Beautiful. Such a pretty color. Flowering plants have a way of making a home cheery. 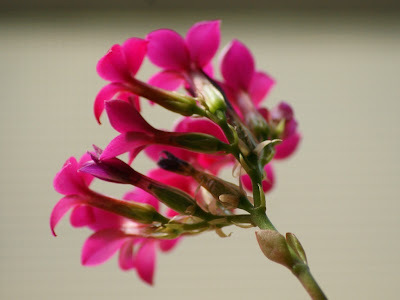 Hi, I also have kalanchoe in my post:) Yours has so beautiful colour! Wonderful deep color! 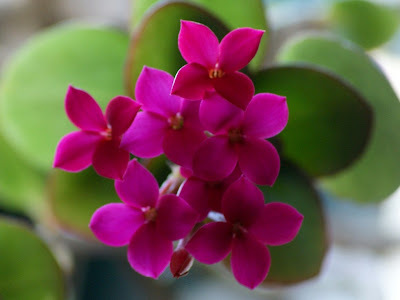 No wonder you are fond of such a beautiful flower! Beautiful colour and great pictures!! What beautiful flower this is! I've never seen -nor heard -of this one before. It is just gorgeous though. And they're so eaey to root.Just break off a piece and stick it in dirt.Lovely post. What a pretty flower! I hve never met this one before. It just goes to show what differences there are in garden fashion between cotinents. They are a fairly hard to kill flower, so good for an office environment!! And a perfectly WONDERFUL colour!! Beautiful flowers, they sure brighten up your office. Gorgeous color and a lovely delicate little flower. Great photo! Btw, i added you to my facebook friends. I hope you accepted it. Both of these shots are very lovely! Gorgeous color! I'm in love with these pink thing. So pretty. They're beautiful! I love the colour, it's quite striking.